I continue to be stirred no shaken. In the years since the event of the 9-11 tragedy, we have spent billions to stop the "war on terror" to stop the next terrorist attack and spent little of our resources on the true threat, that of Natures ability to respond to climate change and her own set of rules. Now then I ask, when are we going to collectively wise up? Impossible to war with Nature and expect to win. There can only be humble respect, submission and understanding that maybe we've been too complacent about Natures ability to destroy and disrupt in favor of being afraid of the unknown terrorist. Remain calm folks and when we are done cleaning up the mess from Natures wrath, let's get together and plan our future cities and towns with the Environment in mind. Al Gore "Dirty Energy makes Dirty Weather"
Statement on Hurricane Sandy This week, our nation has anxiously watched as Hurricane Sandy lashed the East Coast and caused widespread damage--affecting millions. Now more than ever, our neighbors need our help. Please consider donating or volunteering for your local aid organizations. Sandy was also affected by other symptoms of the climate crisis. As the hurricane approached the East Coast, it gathered strength from abnormally warm coastal waters. At the same time, Sandy's storm surge was worsened by a century of sea level rise. Scientists tell us that if we do not reduce our emissions, these problems will only grow worse. In stewardship of an urban park, we can no longer use the old adage "leave it alone" succumbing to fears about not thinning or felling trees that would positively help restore the landscape designed by man in the first place. "We need to love nature with more intelligence." Charles Birnbaum. That's why the conference entitled Bridging The Nature/Cultural Divide, is so compelling. One question raised "What do we preserve today?" Eric Sanderman: "Nature doesn't think of states, but regions." He spoke of Mannahatta (Manhattan of 400 years ago) saying if you dropped an indigenous person into a section of the island, they would know just by looking at the trees, the undergrowth, what kind of habitat it was and the animals that lived there. Same in our 21st century urban environment, "if you were blindfolded and dropped into Times Square, you'd be able to say a lot about the environment." We all have the ability to fit and understand our environment. The point being, that there is a large network that we are all a part of. Another point raised, if you removed man from the planet, nature would restore, if you removed insects, the environment would collapse. It says a lot doesn't it? Todd Forrest from the Bronx Botanical Garden: "we've learned we can no longer say Mother knows best in an urban park design," in truth, "the genie was out of the land." Michael Boland Wildlife Conservation Society: "wildlife doesn't understand the difference between a national park or a city park… we need to connect parks with corridors to allow migration and movement of wildlife (for example: migratory birds "fly corridor"). A wildlands network. Did you know that the Quail is the state bird of California? Problem is they are all but non existent due to climate change. And the state tree in Illinois is the White Oak, which they no longer plant because they are already in decline. Bright minds throughout the world are learning to adapt to nature's constantly evolving or declining species. Elizabeth Meyer professor Landscape Architecture University of Virginia started up the second session. "Woodlands are affected by use and abuse. To manage woodlands and wildlife in an urban habitat there needs to be a management philosophy." She further added, "Woodland from a cultural aspect, is a result of designed judgement." Designer of the evocative and reimagined Queens Plaza, Landscape Architect Margie Ruddick added that "Art helps people connect with a place and helps proprietary commitment." As a subway musician performing in public spaces I see that first hand every time I perform. Amazing Gift revealed today: The Central Park Conservancy has received the largest donation ever made to a public park to help us sustain the Park's health for generations. John A. Paulson and the Paulson Family Foundation have given $100 million to help maintain and restore every one of the Park's 843 acres. Everyone at the Conservancy and for current and future New Yorkers, thank Mr. Paulson for his enormous generosity. Maintaining Central Park is not easy – and the woodlands, which seem so natural, requires a great deal of attention and balancing the interests of nature and culture (bird watchers, nature lovers, etc). This is an opportunity to hear from national experts about stewardship of urban woodlands. As one Central Park Conservancy said of the park, letting nature run its course is not sustainable. The 843-­‐acre Central Park, originally designed by Frederick Law Olmsted, Sr., and Calvert Vaux, with a succession of additions and refinements by Samuel Parsons, Jr.,Michael Rapuano, Gilmore Clarke and others, is also host to 230 bird species, along with turtles, fish, and countless species of butterflies, dragonflies, and other insects. The Central Park woodlands are among the most historically significant designed landscapes in the country, providing valuable refuge for wildlife and New Yorkers alike. In the 1960s and 1970s, Central Park experienced an unprecedented decline, suffering from neglect and a lack of management. Litter filled its waterbodies; its Great Lawn was a great dust bowl; its woodlands were avoided, not celebrated. The Central Park Conservancy, a private, not-­‐for-­‐profit organization created in 1980, has skillfully and successfully reawakened, restored and maintained a world-­‐class icon. Nevertheless, managing a park that is both a culturally significant landscape and natural habitat is delicate; this conference specifically examines sustainability, the agendas of different constituencies, diversity, the role of people, and public education. Creating a progression of varied landscape experiences was a primary goal of Central Park's designers. Within the landscapes themselves, horticultural diversity was also a goal. In the Ramble, both exotic and native plants were to provide a sense of lushness and intricacy, realizing Olmsted’s intended "wild garden"effect. Neglect of the Park’s woodlands over a prolonged period resulted in a lack of horticultural and social (as well as scenic) diversity. What park stewards know is “letting nature take its course” is not sustainable. While the woodlands serve to provide the experience of escape from urban life, they are in fact designed urban landscapes that require consistent management. Registration is $150 and is available at the conference Web site. The Central Park Conservancis the presenting sponsor, with additional support provided by Landscape Forms and the Museum of the City of New York. About The Cultural Landscape Foundation: The Cultural Landscape Foundation provides people with the ability to see, understand and value landscape architecture and its practitioners, in the way many people have learned to do with buildings and their designers. Through its Web site, lectures, outreach and publishing, TCLF broadens the support and understanding for cultural landscapes nationwide to help safeguard our priceless heritage for future generations. All around the world a Food Revolution is emerging. As a singer songwriter the power of song and inspiration figure prominently in my life so does food. I awakened to the need to know my food source and stay clear of Agribiz in my early 20's when first I discovered that I had Hepatitis C. I have found my choices of eating healthily have made me stronger, clearer, more focused and certainly healthier. I want to give a shout out to 2 amazing individuals who are bringing the food revolution into the lexicon of our lives : Ted D'Cruz-Young of the newly developed Homecooked Food Cooperative MealKu, and Jamie Oliver of Jamie's Food Foundation. Mealku is THE Homemade Meal Cooperative where the best homecooks in the land share carefully prepared meals. They handle delivery. I met Ted D'Cruz-Young developer and founder of Melku, one afternoon at a LIRR Music Under NY gig where I was performing, Ted stopped for a moment and then invited me to sing at his launch party. I have enjoyed performing at many of his inspirational events to help get his food revolution growing in NYC. Our mission is to provide a place for everyone to ﬁnd delicious, healthy meal options with easy access to locally-prepared food from trusted neighborhood home cooks. Mealku is a homemade meal cooperative that supports good food practices, community outreach, and local businesses. Simply and fundamentally, we whole-heartedly believe that good food should be universal and affordable. We are creating a platform where home cooks can connect with one another, collaborate their efforts, and share valuable skills and wisdom. Join the Good Food Revolution now! And it's thanks to Ted that I learned of Jamie Oliver. Mealku has partnered in an event with Jamie's Foundation where I will be performing. Nothing I like better than helping to change the world through song and food! Jamie's Food Revolution aims to change the way people eat by educating every child about food, empowering families by arming them with the skills and knowledge to cook again, and inspiring everyone to stand up for their rights to better food; which in turn will fight the epidemic of diet-related diseases. Earth Day is Every Day. I have a wonderful image of billions of people around the planet consciously thinking, acting and learning about our Earth in the most healing and positive of ways. She has given us so much, and now more than ever we need new tools to listen and ultimately change the way we have been treating our home. We have to take responsibility for our consumption and our waste. We can't just throw it all away, it's got to go somewhere. What goes up must come down, what goes in must come out, so just because we can't see it (unless you live near a landfill, or happen to watch a garbage barge float by) doesn't mean it's not there. What is mine becomes yours, for better or for worse, so let's try and do better. Observe the wonderment of Nature, and give thanks. walking through the woods, found this acorn nestled perfectly. Nice catch. Here's some ideas on how to be more environmentally thoughtful for the Holiday shopping, gift giving season. Shopping has an environmental cost, especially online shopping with extra packing and shipping cost of transporting those gifts door to door. Did you know that 25% more waste is produced between Thanksgiving and New Year's? Be mindful of how to reuse packing boxes and materials. When shopping, bring bags with you so you don't arrive home with so much unnecessary waste. Recycle old wrapping paper, cards, boxes and packing materials. I collect throughout the year and reuse. What to do with the plastic bubble wrap shipping envelopes? I reuse those too, either covering over the address to add the new one, or filling a box with them as packing materials. 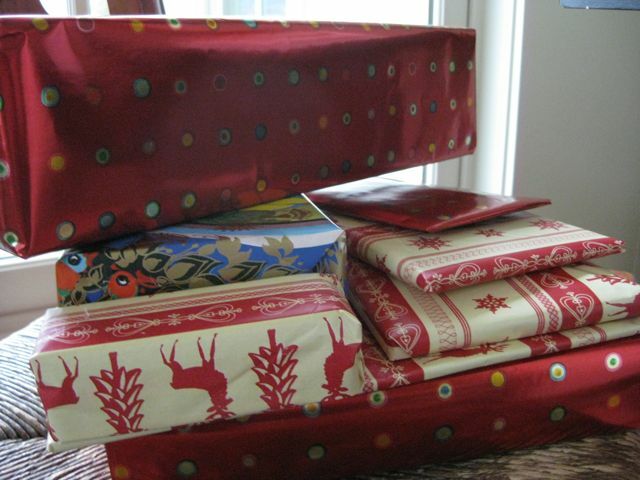 Most wrapping paper and cards use toxic paint and dye. I try and reuse those as much as possible. I also take last years Holiday cards and cut off the covers and find a creative way to send a "new" card to family and friends. Or make Christmas tree ornaments by cutting out shapes and holiday images. For wrapping paper, I save and trim off any old tape or ripped sections. This year I used all old paper to wrap gifts. In our family with people as far away as Oregon, North Carolina, Georgia, Michigan and Florida, we were happy to pack our Christmas packages with boxes and packing that we reused from previous packages. In our apartment with little space, I do break down the box and store flat in the back of the closet. Sure I need to use extra packing tape that way, but it's better than throwing the entire box out. so much better to use an already existing box. Imagine the energy used to take a cardboard box and turn it into a new one. I'd rather just use the old one. When I get those pesky Styrofoam packing peanuts I fill up a small plastic bag like one you can get at the veggies aisle at the grocery store. With an old twist tie from a bag of bread, I tie off the bag. These small packs of packing I reuse to fill my boxes and more importantly the recipient doesn't get to open a box with Styrofoam peanuts flying all over the place. If I can't use them, then I donate to a local shipping store. 1-Reuse wrapping paper. Think twice before crunching up wrapping paper, take a moment and fold and save for next year. 2-Reuse boxes and packing materials. If you can't reuse, find a local shipping store and donate your boxes and packing materials. They are happy to have them. 3-create new creative cards and ornaments form old Holiday cards. 4-Bring your own shopping bags with you to the store to reuse multiple times instead of gathering more waste. Not bad, all these gifts were wrapped with reused paper! E-waste FAQ from the Lower East Side Ecology Center website: Why should I recycle my old electronics? What happens to the computers that people bring to events? Is my personal information on my computer safe? Do I have to delete the hard drive? What can I bring? What do I do with household batteries? Is there a limit to how much I can bring? Do you offer pick-ups? Can I take used items at the recycling events? Can I receive a tax deduction for donating my computer equipment? How can I have an Electronics Recycling event in my neighborhood? The Ecology Center is holding an electronic waste ("e-waste") recycling event at Tekserve in Chelsea to responsibly recycle unwanted or broken electronics from New York City residents. This is one of 17 e-waste recycling events that the Ecology Center will be holding in all five boroughs in September and October. A list of acceptable materials can be found here and we accept electronics from households and small businesses (less than 50 employees, please call ahead) as well as not-for-profits. We do not accept home appliances such as microwaves, refrigerators, or air conditioners. The electronic waste recycling program is made possible by Tekserve. Transit: Take the F or M train to 23rd Street, walk 1 block west or take the M23 bus. Driving: The event will be on the north side of West 23rd Street between 6th and 7th Avenues. Here's the 2nd installment of my Green Apple blog for Busker site The Noise Beneath The Apple. Today, I thought I'd share some tips on 2 things most NYC buskers use every day on the job, Batteries and Metro cards. Batteries: Street/subway musicians for the most part use battery powered amplifiers and playback units. It's a must to use rechargeable batteries. Of course the initial expense is higher than using alkaline batteries, but the result does mean financial savings, more hours on one battery and less waste. There's no easy solution where and how to get rid of used/dead batteries. Do not to throw batteries in the trash. If the law is an incentive, as of 2006 it's illegal in NYC to discard rechargeable batteries. Batteries are toxic that leach serious metals/chemicals into landfill if not properly discarded. It's amazing that we still don't have a great way to return/recycle batteries, follow the links to sites in your area that do. The good news is that most companies will take your rechargeable batteries for recycling. Just ask. If they don't, your asking might finally prompt them to do something and make a new policy. That's how it's done folks, old-fashioned care and demand for change. These sites can help: The Lower East Side Ecology Center and Call 2 Recycle both have local e-waste information(collection of batteries, small personal devices and larger items like computers and printers). I save my used batteries in a take away container and return when I have enough to make the trip worthwhile. The BGA, Broadway Green Alliance, made a fantastic campaign and got Broadway houses to switch their Marquee's to LED lights and rechargeable batteries for all their body mics. Imagine the amount of eco-energy savings. And there's still juice left over, enough to use in ushers flashlights. Cool. Metro cards: Unless you like to use them to clip on you bike spokes, learn to reuse your metro card. Cards are good for 1 year so that's one years worth on 1 card. Think of the eco-savings. Then you can use on your bike. Make sure to check the expiration date on the back because unfortunately you have to send the card in for a refund after expiration date. Earth Day is every day in my world, but this week and especially tomorrow April 22nd is the 'official' Earth Day, now 41 years in existence. I remember the first one back in the 1970's and thank my Mom for opening my eyes to being more mindful and earth friendly. Japan's tragic earthquake and tsunami have had horrific and catastrophic repercussions on shortsighted human made environments i.e building nuclear power plants on earthquake fault lines, and ignoring tsunami calculations. It's one year since the BP's Deep Water Horizons off-shore drilling disaster. Drilling is not the answer. Finding new technologies away from our deep addiction to oil, is. Hey we moved on from the horse when there was great resistance to automobiles. I've just returned from a trip to France, gas there is $8+ per gallon. I took a high speed train from the south of the country to Paris, it was efficient, comfortable and cheap. Along the way I passed a field of wind turbines. They might not be pretty to some people, and there is that whole NIMBY (not in my back yard) rage, but we have to do something to counterattack oil consumption. And let me add this thought, if a wind farm was hit by an earthquake and tsunami, no one would be evacuating for miles or stopping to eat livestock or agricultural harvests for seasons/generations to come. 3) ...reduce, reuse and recycle. How many bags do you throw away, how many items could you reuse but find too time consuming to do anything about. What do you do with all your now obsolete gadgets? Find an e-waste depot near you. Doing nothing is the wrong option. So my thought for Earth Day, we have to take responsibility for our consumption and our waste. We can't just throw it all away, it's got to go somewhere. What goes up must come down, what goes in must come out, so just because we can't see it (unless you live near a landfill, or happen to watch a garbage barge float by) doesn't mean it's not there. What is mine becomes yours, for better or for worse, so let's try and do better. The Noise Beneath the Apple™ TNBTA is a global e-zine that focuses on the people, players and politics of busking and street performers. Believing that busking is a collective adventure, social commentary and political statement. Street performing promotes culture, preserves community and creates an environment for our ever changing times and human evolution. Their subject matter is produced by a team of passionate bloggers, music professionals, policy makers and enthusiasts from around the world. Heather Jacks and photographer Bryan Close came by Staten Island Ferry terminal last week to meet and film me for this amazing project. I am excited to be asked to write a blog on TNBTA. I'm particularly interested in sustainability and how we can make our world more environmentally protected. You might have seen my Sustainability section on my site where I share stories, information and links on how to learn to make a difference. On The Noise Beneath The Apple, I call it "The Green Apple." check back for more blogs and great exposes on some pretty great subway performers. how about liking The Noise Beneath The Apple facebook page too. Juli's got things into perspective and is doing something to help reduce and stop our addiction to plastic. She writes a great blog called Plasticless NYC. Haven't you ever thought about where all those bottles go? Even if we do recycle them, there is so much energy and waste and pollution that goes into making/re-making them. Here in NYC, in my humble opinion we have the best tasting water. What happened to enjoying our own tap water in a glass? 10. You can say "Yeah, I'm drinking the Kool-Aid" without a hint of irony. 8. Kool-Aid is a lot less expensive than Vitaminwater products. 7. Unlike Vitaminwater, Kool-Aid doesn't brag about how nutritious it is, then have its lawyers say 'no consumer could reasonably be misled into thinking our product was a healthy beverage'. And Kool-Aid even has 10% daily value of Vitamin C.
5. The money you spend for Kool-Aid isn't going to multimillion dollar celebrity ad campaigns (yuck). 4. You generally don't see Kool-Aid packets littering city streets. Vitaminwater bottles? They're all over the place. 3. Instead of drinking stuff that looks like Kool-Aid, you could just drink Kool-Aid. 2. Vitaminwater is over-hyped and over-exposed. Kool-Aid is retro. 1. "Hey, Ellen DeGeneres!" just doesn't have the same ring as "Hey, Kool-Aid!" Leave Only Footprints: giving up plastic one month at a time. Elizabeth Royte's blog Notes On Waste, Water, Whatever (author of Bottlemania: How Water Went On Sale and Why We Bought It). 5 actions you can do your part in reducing our addiction to plastics=petroleum based products. As the nuclear catastrophe continues in Japan, my heart goes out to the Japanese people, not to mention all of those who will be affected by the disaster. Radiation, knows no borders. How about our Energy policy? Just in case you're not, FYI there's now a no-fly zone over Fukushima power plant. Nuclear power means increased risk of disaster. nuclear power peacefully? Is that possible? did I just hear someone say we're at more risk of dying while texting and driving? Interesting how Japan the recipient of this civilizations lowest moment in it's history has full circle returned to the source of it's pain. the power of nuclear explosions. Japan is on the nerve ending. My heart aches, my within me vibration is on alert. the only way to make it right is to fight to find a way.